May is National Barbecue Month, a perfect time to establish your barbecue bona fides. Will this be the year you master the porterhouse? Make your own home-cured bacon or pastrami? Nail a competition-quality brisket? It’s also the time of year to cast a critical eye on your grilling hardware. For some people, that means refurbishing grills that grew sclerotic over the winter. For others—and here I raise my hand—National Barbecue Month gives you license to shop for a new grill or smoker. “Which grill should I buy?” is one of the most frequently asked questions on the Barbecue Board. Unfortunately, there’s no “one-size-fits-all” answer. I like the overall versatility of a Weber Performer (you can grill, barbecue, and smoke on it), but a convenience-minded gas griller, or diehard wood griller, wants a different sort of live fire experience. Here are eight questions to ask yourself before you make your purchase. Many decisions in life are circumscribed by what you can afford. Cars, houses, and of course, grills. You can buy a serviceable grill for $100 or drop thousands on a stainless steel supergrill. Big spenders will be tempted by the new wood burning Gaucho grill and rotisserie from Kalamazoo Gourmet ($23K, and there’s a waiting list). Establishing a budget will narrow the field and help you find the best grill or smoker for you. Charcoal, gas, wood-burning, or other? If you’re as addicted to smoke as I am, consider a wood burning grill or an offset smoker (a.k.a. stick burner), like a Horizon—that slow smokes pork shoulders and briskets with nothing more than wood smoke. Personally, I think food smoked or grilled over wood has an incomparable flavor. If chopping or hauling wood sounds like a chore, you might investigate pellet grills, like a Memphis Wood Fire Grill. Fill the hopper with hardwood pellets, then preheat to the desired temperature. The convenience of electricity with the flavor of wood. Several companies, including Char-Griller, Dyna-Glo, and Smoke Hollow, manufacture grills that can burn either charcoal or gas. Kalamazoo Gourmet sells a hybrid grill that burns wood in addition to charcoal or gas. If you have limited outdoor space or are prohibited from cooking with live fire by condominium rules or the terms of your lease, consider an electric smoker, like a Bradley. Read online reviews or consult the knowledgeable Barbecue Board community before making a decision. Let me rephrase that. What’s the maximum number of people you’ll likely cook for? Maybe you and your big-screen TV host a tailgating party on Super Bowl Sunday, or maybe you invite the whole neighborhood to your backyard for the 4th of July. Consider a Horizon Smoker, Weber Ranch, or Big Green Egg XXL. Or maybe you’re a burgers and brats kind of griller, cooking for your immediate family. Consider a Lodge Sportsman hibachi or a Pit Barrel Cooker. But I always encourage people to buy more grill than they think they’ll need—you’ll grow into it. The figure that matters is the size of the primary cooking grate, expressed in square inches. (Some manufacturers pad the numbers by including warming racks.) If you plan on roasting beer can chicken or the Thanksgiving turkey, make sure there’s enough vertical height between the grill grate and the top of the lid to accommodate them. What foods do I enjoy grilling/smoking? The foods you cook—or aspire to cook, like a whole pig—should influence your purchase. Steaks, chops, chicken breasts, fish fillets, veggies, garlic bread, etc., require only a grill grate and a strong heat source. You don’t even need a lid. Ribs, pork shoulders, whole chickens, leg of lamb, prime rib, beef tenderloin, pork tenderloin or loin roast, and dense vegetables like potatoes are best cooked by indirect grilling. You’ll need a grill with lots of grate space, easy temperature control, and a high lid. What additional features do I value? Many grill manufacturers offer a variety of options—side burners, infrared burners for high temperature searing, rotisseries, cast iron grill grates, digital upgrades, side tables, warming grates, custom work tables, thermometers, insulated covers for cold-weather grilling, etc. All come at a price, of course. And the more electronics or moving parts a grill has, the more control, but the more potential for problems. If you’re a tailgater, camper, or vacation property owner, you’ll want a grill that travels. Size and ease of set-up are important considerations. There are several good portable grills on the market. Check out Coleman’s RoadTrip LXE, a 2-burner propane grill that gets high marks from tailgaters, or Mini Big Green Egg, or Weber’s Q or Jumbo Joe charcoal grills. How much space can I dedicate to a grill or smoker? Unless you have a large patio or backyard, the grill’s footprint will influence your buying decision. Kettle grills, water smokers (like the Weber Smokey Mountain and Napoleon Apollo), and upright barrel cookers, like the Pit Barrel Cooker, are very space efficient. 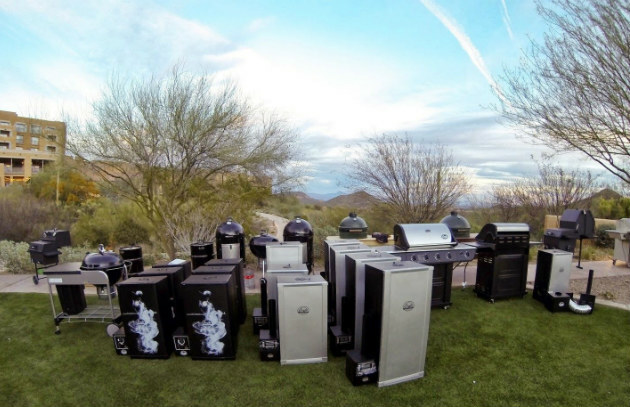 Offset smokers and stainless steel supergrills take up considerable space. Most grills last longer when protected from the elements. Do you have space in a garage or outbuilding when not in use? The Hearth, Patio & Barbecue Association (HPBA) reports that 80 percent of all grills shipped in 2013 were priced at $300 or less. The majority were gas grills. This suggests many people consider their grills quasi-disposable, something they expect to eventually replace or upgrade. In the past decade, many grill manufacturers have moved production overseas or taken other steps to cut costs. Predictably, the quality of materials and workmanship has declined noticeably. So before you buy, “kick the tires.” Does the grill seem well made? Does it feel solid? Is it constructed of heavier gauge metal that will hold the heat, especially if you grill year round? Does the lid fit tight? Do the welds look strong? A reliable indicator of quality is the warranty: 1 to 3 years limited warranty means the manufacturer expects you to replace the grill soon. A lifetime warranty—yes, some grills and smokers come with them—suggests you’ve made a long-term investment, one that will hopefully pay dividends for many years to come. Find out which grills and smokers BarbecueBible.com recommends.